Light enters the eye through the cornea, a transparent region of the otherwise white sclera. The cornea provides focusing power for the eye and is the surface that contact lenses are placed upon. Because the cornea is transparent, the colored iris is visible behind it. The pupil is the dark, round opening in the center of the iris. It is an aperture that regulates the amount of light that enters the eye by constricting in bright light and dilating in dim light. Though the scientific data is conflicting, large pupils at night are generally considered a risk factor for glare and halo problems after laser vision correction. Directly behind the pupil is the lens, which also provides some of the eye's focusing power. During reading, muscles in the ciliary body contract, which changes the shape of the lens and brings near objects into focus. Around age 40, the lens becomes rigid and the muscles are no longer able to change its shape, so reading glasses or bifocals become necessary. The retina is made of photosensitive cells that convert light images into electrical impulses that travel via the optic nerve to the brain. 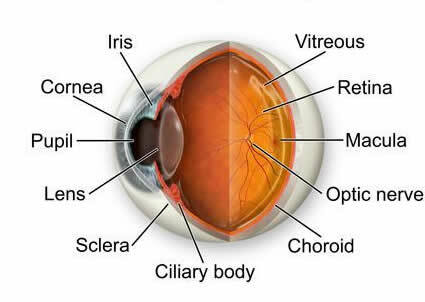 The macula is a specialized area in the center of the retina that is responsible for fine detail. The focusing power of the cornea, the focusing power of the lens and the length of the eye determine the clarity of the vision. If these elements are matched together perfectly, light rays are properly focused on the retina and the vision is clear.